Thanks for lending recognition to the emerging field of metabolomics and its ability to provide a detailed view of metabolism in health and disease (“Telltale Patterns,” Winter 2011). The technology is bound to play a key role in the battle against obesity and obesity-related disease. Though treatments for metabolic syndrome, type 2 diabetes and cardiovascular disease are improving outcomes for many patients, prevention will likely offer a more cost-effective option. Metabolic profiling has the potential to identify metabolite signatures that precede disease onset and thus can be used to identify those at greatest risk. In my 1978 novel The House of God, I described the experiences of interns in an academic hospital. The book is full of examples of on-call periods—some as long as 36 hours, with only 12 hours off—that induced mind-numbing fatigue. I catalogued many fictitious but fact-based examples of terrible patient outcomes, including death. Proto’s astute review of the new residency duty-hour limits (“On the Clock,” Spring 2011) reinforces my view that new studies are necessary to prevent serious patient harm. The two arguments against the current reform are: Training will suffer or need to be lengthened, and hospitals can’t afford it. Neither is convincing. Though increased handoffs of patients from doctor to doctor is a concern, there have always been handoffs in medical training; it’s a skill one develops. Moreover, the quantity of time spent with patients is not nearly as important as the quality. Information now is at everyone’s fingertips; the challenge is to be a human being to other human beings who happen to be our patients. In addition, we can’t talk about not having enough money to train doctors unless we talk about stopping the wars, regulating the bankers and taxing the rich. If we did, we’d have enough left over to make medical school free, contingent on two years of public service. 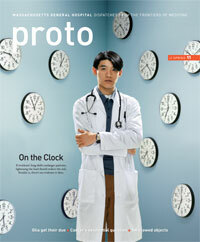 When I opened my spring issue of Proto, I was startled to see an X-ray of a baby with open safety pins in his esophagus (“Foreign Bodies”). I was immediately reminded of a story that I had been told about my father being fed safety pins and other objects when he was very young. As I turned the page of the article—an excerpt from Mary Cappello’s book Swallow: Foreign Bodies, Their Ingestion, Inspiration and the Curious Doctor Who Extracted Them—I got a second shock. There was a photo of some of the 30 objects taken from an infant named Joseph B.
I knew this was my father, Joseph Burke. In May 1923 he was fed safety pins, buttons and many more items by a babysitter. My grandparents traveled from their home in a Pennsylvania steel town to take him to a hospital in Philadelphia, where he was treated by the renowned physician Chevalier Jackson. I contacted Ms. Cappello, who had tried in vain to find my father (he died when he was 59) and his family. My three siblings and I have plans to meet her at the Mütter Museum in Philadelphia, where she will show us the objects extracted from my father. Rita Sassaman // Framingham, Mass. Read the Philadelphia Inquirer’s story about Rita and her family's visit to the Mütter Museum here.